We have 3 boxers in our home now, KT, Nitro and Nitro’s little sister Tessa. 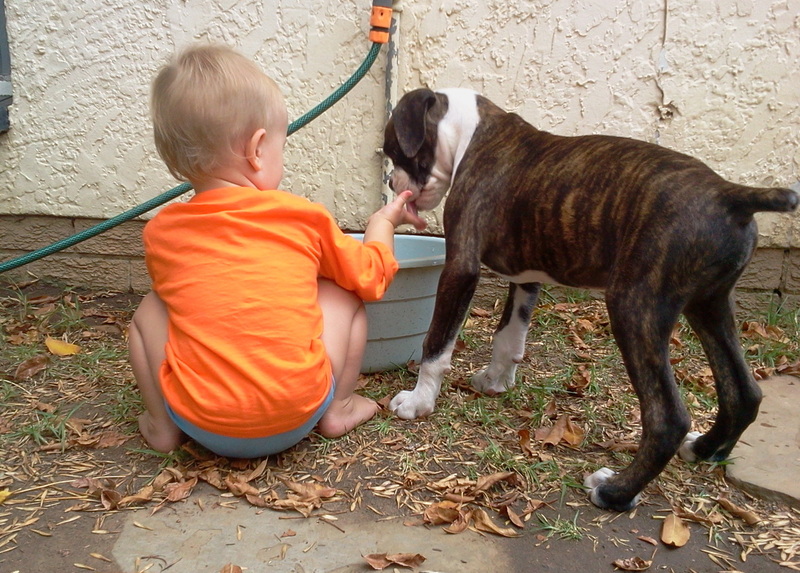 Tessa is DH’s brother’s dog – when he heard that we were going to get a boxer puppy he told DH to get him a female if there is still one left. Well there was, so DH took two from the breeder. BIL and his family are on holiday now so we are puppy sitting Tessa, and Nitro, KT and Baby G all love having her here. Yesterday or today (I’m not sure exactly which day) 2 years ago Baby G was conceived. 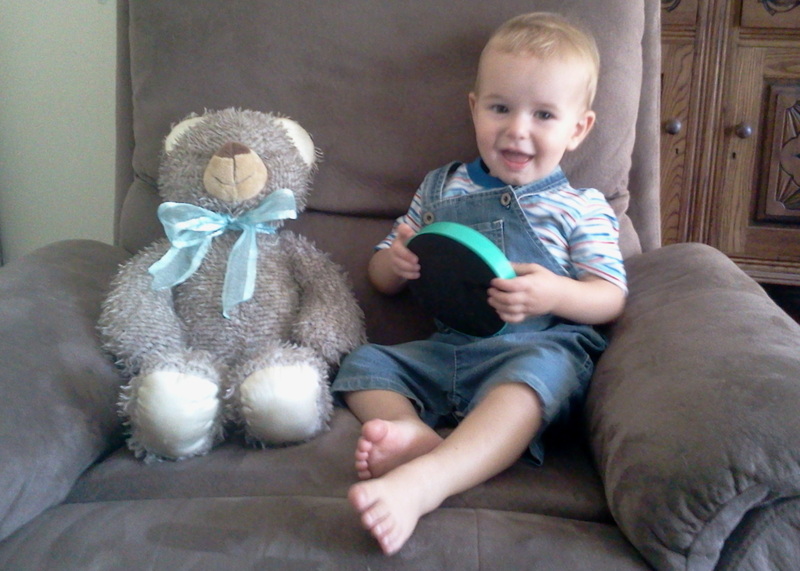 He is 15 months already and its scary how quickly time flies and how fast they grow up. I saw DH’s cousin’s 5 week old baby on Friday and it feels like I’ve forgotten all about having a new born baby and it’s hard to believe that Baby G was smaller than that. I must say I really enjoy this age that Baby G is now. He is so incredibly cute – the things that he does and says amaze me sometimes… He really loves to sing and dance for us, especially if there is music playing on the TV in the background. Sometimes he claps his hands when he hears a tune that he loves. But the best is the fact that he loves to hug us lately and his daddy is his absolute hero. Favourites: He has a few favourites, water is still one of the best things to play with, but Nitro and KT are also high on the list, together with his teddy bears, but lately he has these little cups that fit into each other and he loves to take them apart and then put them all back together. The first time it took him about half an hour to figure out, but it’s not taking him very long now to sort them all from big to small. Teeth: Still 6 teeth and I don’t think he will get more anytime soon. Sleeping: He had a few more good nights but also a few bad nights this past month. Overall he wakes once a night anytime from 2h30 to just before 5h00. We have had a few instances where he would wake up and either talk or cry, but he would fall asleep again. I always wait a bit before I go to his room. Hopefully he will soon learn to sleep through every night… He is taking 1 or 2 naps during the day at the crèche but at home he prefers to nap once from about 11h00 or 12h00 for an hour or two. I think the naps at home are longer than the naps at crèche, because it sounds like they are about 30 minutes or so. Eating: One good thing about the crèche is that Baby G is eating more and better now. They certainly taught him to eat bigger volumes and it seems that he is less fussy and eats more veggies now. I still nurse him during the night, when he wakes up in the morning, in the afternoon after I fetched him from crèche (around 13h30-14h00) and then again before he goes to bed. He also gets a snack in the afternoon and eats dinner with us. I think he will gain more weight from now on now that he is eating better. I have noticed that he is quite small (or rather thin) compared to the other kids at crèche. Milestones: One thing that I noticed one day at the crèche was that baby G pointed to his eye when I was talking to the receptionist there, and she asked what colour baby G’s eyes were. Sometimes he will point to his nose too if I ask where his nose is, but he is not so successful at pointing to his mouth, ears and hair. I’ve also asked him to point out my eyes and he will do that too. 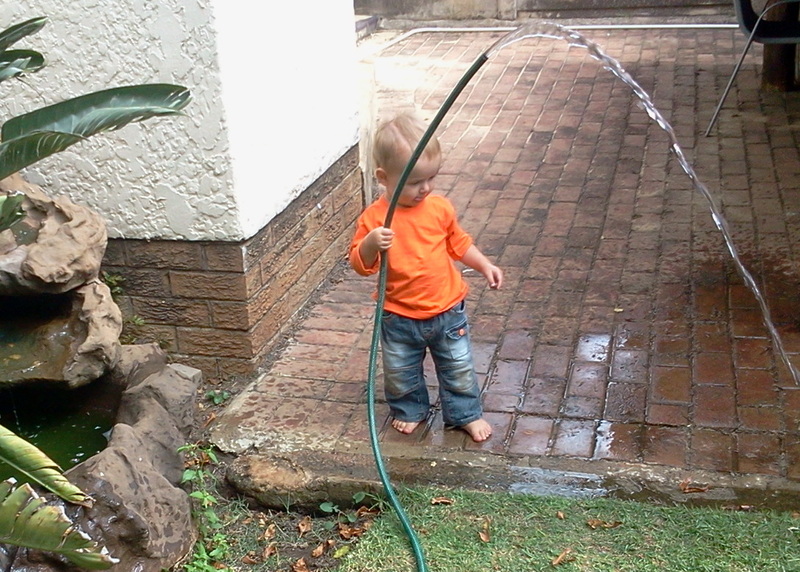 I was totally amazed, and we didn’t teach him to do it, nor did they teach him at the crèche. Baby G really loves to imitate us. We have a large tree next to our house that is losing its leaves now and we are often sweeping leaves up outside our back door, or raking them up on the grass and he loves to play with the broom or rake. Anything that might just look like a phone is pressed against his ear and he talks up a storm in his own baby language when he puts it to his ear, but try to put a real phone to his ear and he shuts up completely and he only has this funny smile on his face. He loves to try and unlock any doors with locks that he can reach, and most of the time he tries to unlock it with something other than the key. Our Car keys and the house keys are also a favourite and he’s set off the alarm already by pushing the button on the remote on DH’s keys. Yesterday Baby G was playing with a baby doll that my sister’s girls left here and a little while later I was sitting on the couch nursing him and I heard a baby. I looked out of the window, because there were no babies on the TV, and baby G was quiet so the only place it could come from was outside, and I asked aloud, “where are the baby sounds coming from?” Baby G looked at me, grabbed the baby doll and said, “My baba (my baby).” I called DH to let him hear and baby G said it a couple of times so that DH could also hear. It was so sweet. I wonder if seeing DH’s cousin’s baby made him more aware of babies, or maybe he picked it up at crèche. Other new words are: klaar (finished), woef (barking sound). 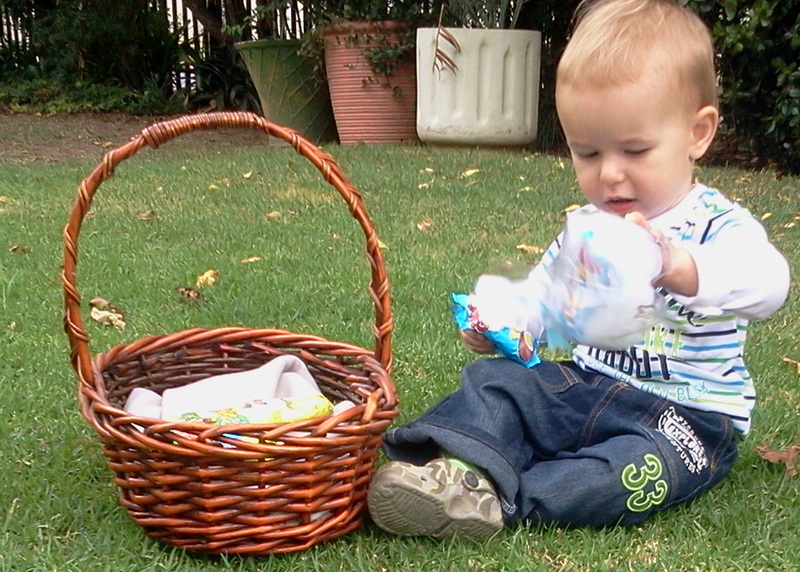 Firsts: Yesterday we scattered some Easter eggs all over the lawn and let baby G look for them. He only looked for a few before he decided that the container with 2 eggs he got from his teacher at crèche was very interesting and he did not want to look for any more. KT also decided that she wanted to eat one, so the Easter egg hunt was over quite quickly. I’m sure next year it will be a lot more fun. Baby G enjoyed eating a bit of one too! Looks like he loves chocolate!